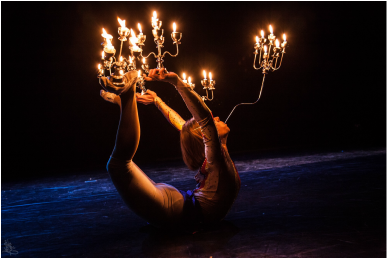 I'm a circus artist based in London, specialising in contortion - with and without my chandeliers, handstands and static trapeze. I have completed a BA degree in circus arts at Turku University of applied sciences in Finland and also been trained in the legendary acrobatics village of Wuqiao, in the Wuqiao acrobatics art school for the year of 2013 and also having trained contortion and handstands in the famous Beijing acrobatic school. I have performed in traditional and contemporary circus shows, cabarets and private events, but my interest is not only limited to those and I'm also happy to take part in collaboration and creation of new show concepts as well as bring my act in to give your event something special and memorable.